Interesting find here, too, is that an insurrectionist militia member from Illinois has talked to members of the NRA leadership. Would you like photos Ladd? Howabout some video? Their big 'threat': Many more to come. Scaaarrrey. But I was the first one they thought of. That made my whole day. They've officially devolved from gun ban activists to internet trolls. Not very observant ones at that. OMG! You spoke to NRA leadership? And they didn't immediately recognize you as a traitor-insurrectionist-mass murderer? And then they didn't repudiate you as soon as they found out? Well, now maybe Ladd can send you a Christmas card! So incredibly easy to find personal addresses on Spokeo. This is a really bad road for them to go down. Damnit, Third, you stole the "names are power" line I was going to use when they invariably got around to me! There are just so damned many ways this situation is high-larious... Joan Peterson asks why we would blog anonymously, but she asks this of the organization that has threatened to break apart a man's family over a difference of opinions. Ladd seems to believe this "outing" will somehow intimidate us into silence (exposing his desire to inflict "Reasoned Discourse" on the world), but, in reality, this incident will only serve to spur us on even harder to show the CSGV as the scumbag organization it is. And, last but not least, the CSGV is admitting that they can no longer support or defend their positions with reasonable, rational, logical arguments, and instead have resorted to plain old bullying. They have become the JadeGold of the Twitterverse. It's a note from the victim dis-armament crowd. They think their fears are your fears. I think it's called "projection? Again All anti-gun activists are Jadegold, just some conceal it better. No, I am Roy Kubicek! At least you don't have to worry about any anti-gunner showing up to your house and shooting you. 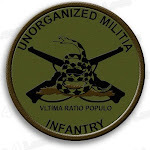 But you should watch out for those scary militia types. He just put another name up that we all knew anyway. I think he's just going down the list of people on twitter who make him angry and he wishes would just die. I wouldn't lose any sleep over anything anyone from one of these anti-Second Amendment groups say. In fact, I have come to the conclusion that trying to intelligently discuss anything with such people is utterly futile. It is like reasoning with an 8-year old. ZOMG! YOU'RE A NORMAL PERSON AFTER ALL!!! "It is like reasoning with an 8-year old." And a not very bright one, at that. @TrailerDays Yet another blog about us! You just can't help yourself. "Obsession." This, from the guy who goes scouring the internet to "research" the identities of pro-gun bloggers--most of whom (if not all) haven't been trying to conceal their identities in the first place. @45superman We have a practice of not sharing personal info about our staff with those who advocate violence. Never naming any examples of my "advocat[ing] violence," and refusing release of a scrap of very general demographic data, then releases much more personal information--full name (middle name included), age, city--about gun bloggers. Hey, ThirdPower since you and Ladd are buddies, could you maybe ask him to do me next? My blog needs the publicity.